Graphics One introduced its new 901X 24-inch Dye Sub Printing System at the SGIA New Orleans. 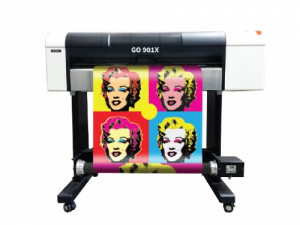 The GO 901X Dye Sub System is a fully integrated four color high-quality printing solution for 24-inch dye sub printing. The 901X bundle is a complete system and includes the 901X printer, DTX Industrial Dye Sub Ink, Wasatch SoftRIP advanced workflow software, GO Xtreme Dye Sub Paper and stand/catch basket. “Our new system was developed to provide both users who are just getting into this market or those who are migrating to large format, a complete dye sub print system meant for continued long-term high quality output at very attractive pricing. Additionally, the fully featured version of Wasatch’s SoftRIP, the industry’s leading RIP for sublimation, along with new industrial dye sub ink from Prism, immediately makes 901X printing system the market leader in the 24-inch segment” stated Dan Barefoot, VP Global Sales Graphics One. The system will be available in November of 2017 and be distributed through the Graphics One distribution channel, it will feature the DTX Dye Sub ink from Prism Inks.